50 ADC & 90 ADC Field Regulators – Powerformers Engineers (P) Ltd.
Power Formers Engineers announces a new line of stand alone analog field regulators with ratings of 50 Amps DC and 90 Amps DC. Units are current regulated with use of internal CTs and accept a 0-10vdc input. Unit also features field economy, and field fault circuitry. * Units are great for replacing Siemens 3rd generation field regulated supplies, and can be used as spares. * Will accommodate all traction motors (including GE 752* Traction Motors) with high field amps. Designed to be user friendly and installation is a snap with the compact dimensions. This family of field regulators is designed to control the field current of DC motors up to 90 amps. When used in conjunction with either the Mentor II or Quantum III variable speed DC drives, the field regulator is controlled directly via the drive parameters. This allows full customization of the field control for any application. 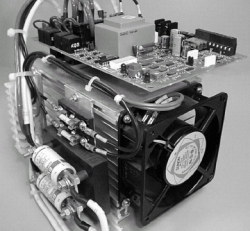 The FXMs can be also be used as stand-alone units when retrofitting existing applications. The field regulators are single phase, controlled thyristor rectifier bridges with a control logic PC board. The bridge can be configured by jumpers to operate in half (single quadrant) or full (two quadrant) control mode. 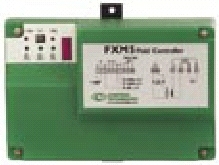 The FXMs may be independently controlled by an external reference, or set for automatic field weakening (constant horsepower) or constant field current. Field economy control via contact or logic input and a field loss relay for protection are provided for stand-alone operation. The unit also has a bar graph display (10% increments of the selected range) for field current magnitude. * Maximum output voltage equals 90% of input RMS line voltage. Field current is the controlled variable.